American anime fans have helped foster a fan base for Japanese pop and Japanese rock in the U.S. However, fans on this side of the Pacific haven't given much notice to Japan's growing techno and hip-hop scenes, despite the popularity of artists like Rip Slyme and DJ Hasebe. The latter, interestingly enough, had a hit song featuring Bonnie Pink, known over here for doing the Rurouni Kenshin closing theme, "It's Gonna Rain." Despite the general lack of exposure, talented artists in those genres have had an influence on the Western scene by performing some of the most interesting music out there today. One of the "should be popular in the U.S. but isn't" groups is the hip-hop trio Kick the Can Crew. Known for a wide range of beats and sounds, the band's energetic music is surprisingly infectious. Kick the Can Crew is known for catchy synth hooks and using a variety of beats such as funk, electronica, and bossa nova. Vocally, the trio is extremely talented at harmonizing their three voices to perfection, which they do often. Instead of becoming tiresome, the trio's vocals become one of the strongest points of their various songs. While their lyrics don't make a whole lot of sense, even in Japanese -- especially on the faster, more energetic songs -- they have an undeniable sing-a-long quality. The musical qualities of the vocal and non-vocal sounds in the band's songs will endear them even to those who aren't hip-hop fans. 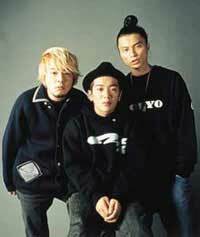 Kick the Can Crew formed in 1998 with Kreva, MCU, and Little (affectionately known as Japan's littlest rapper) in Tokyo. They quickly became popular due to their many club appearances -- Kreva, for example, took the top prize at Japan's MC Battle three years in a row -- film and TV music, and a flurry of singles. After hitting it big, the trio hit signed with Warner/east west, releasing their break out album Vitalizer, Young Kings, a self titled album, Magic Number, and a greatest hits CD. Since their start, Kick the Can Crew has become darlings of Japan's all-music station, Space Shower TV. Unlike other popular hip-hop groups on both sides of the Pacific, Kick the Can Crew remains influential on the Tokyo streets. They perform in Shinjuku hip-hop clubs on a weekly basis; recordings of some of their live performances -- and performances with other Japanese hip-hop artists -- are surprisingly easy to find. In my mind the single that stands out as perfectly representing both the energetic and mellow sides of Kick the Can Crew is Sayonara, Sayonara featuring an odd and catchy synthetic, almost bell-like hook -- the song is instantly recognizable. Torico! is energetic, fun and much faster paced than Sayonara, Sayonara. On the other end of the spectrum are the band's Kyou Kara Ashita and Lifeline: soulful, slower, yet still toe-tappingly infectious songs. The band's Wha'cha Name? plays at a little sampling, while Iianbee (monorail mix) has the band laying down some beats and rapping with the well-known Japanese folk/fusion band The Boom. Of special interest to American fans might be Kick the Can Crew's music videos. Like the songs themselves, the band's music videos are fun, daring, and a little irreverent. The video for the trio's Vitalizer, for example, features the band rapping in a toilet. Music fans like me are always looking for something new and interesting. For myself, genres don't matter; only the value of the artist and their songs. For those fans of Japanese music bored by the latest pop diva or KISS-costumed rocker, Kick the Can Crew might Vitalize an interest in Japanese hip-hop.